This article is about the trope. For the film, go here. The main characters receive a Distress Call or randomly come across a (seemingly) deserted vehicle and have to figure out what happened and where everybody went. Usually they run across exactly what happened when it tries to eat them. A Big Dumb Object may be involved. And sometimes there are actual ghosts. If you're looking for otherworldly ships with tattered sails crewed by the damned, see Flying Dutchman. For other forms of supernatural transportation, see Ghost Train. See also Send in the Search Team and Late to the Tragedy. Not related to shipping two dead characters. Captain Liliana's ship from Queen's Blade Rebellion can fly and has an Undead Pirate Crew (herself included despite not looking undead). One sequence in Jo Jos Bizarre Adventure Stardust Crusaders had the main characters boarding an apparently derelict steamer, with the only passenger being an orangutan. The steamer was actually the orangutan's Stand, Strength. The ape was extremely intelligent by lesser-primate standards and not too fond of people. Thriller Bark, which is basically a floating Haunted House that serves as the base for Gecko Moria and his flunkies. It's mostly filled with zombies, but one of Gecko's crew, Perona, has ghost-like powers granted by the Horo-Horo Fruit. The ship they found Brook on might be a straighter example: it's a normal, but very old and deserted ship. Except for the walking skeleton. Who promptly gets an invite to Luffy's crew. He accepts. The unfortunately-named Pansy in Martian Successor Nadesico. Soul Eater has the ghost ship Nidhogg, captained by the Flying Dutchman himself. Starship Troopers: Invasion Two Mobile Infantry squads are dispatched to investigate the disappearance of the John A. Warden, only to find it adrift with the crew dead... but no bugs to be found. Once power is restored to the ship, the bugs come out of hiding and swarm. In The Pirates! In an Adventure with Scientists!, one of the ships Pirate Captain attempts to plunder turns out to be a ghost ship, which promptly disappears while Pirate Captain is still standing on it, causing him to fall into the ocean below. 2010, the lesser-known sequel to 2001. Haunting by Bowman. Big Dumb Object that turned Bowman into an ascended being in the first film turns Jupiter into a star in this one. Event Horizon is all about a Ghost Ship, basically a Haunted House In Space! Except it's being haunted by hell itself. Before Event Horizon, there was The Dark Side of the Moon where docking with an old NASA shuttle near the dark side of the moon brings on board The Devil. Before Event Horizon and The Dark Side of the Moon, The Black Hole was about a Ghost Ship In Space. The Crew discovers the USS Cygnus devoid of its people, except for the Captain and his crew of robots. Except that many of the robots are the zombified remnants of the original crew! Deep Rising: A mercenary crew prepares to board a mega-luxurious cruise liner in the South China Sea, only to find empty blood-soaked halls when they run in guns blazing. They soon discover that a few hours before they arrived the ship was attacked by a huge monster, which then tries to add them to the menu as well. Ghost Ship is Exactly What It Says on the Tin. The ship is actually a demonic trap designed to corrupt people who board it, and then kill them so that they go to Hell. Sunshine (2007). The crew comes across a distress signal from one of these. They would ignore it if not for the fact that their own mission was a consequence of its unexplained disapperance and its cargo could be of immense assistance to them. Everything that goes wrong thereafter, whether by accident or malice, stems from this well-meaning decision. The derelict ship in the original Alien. Monster, obviously. Sphere. Big Dumb Object grants uncontrollable psychic powers. Monsters. Supernova. Big Dumb Object makes people younger, or something, ... until it blows up. Pandorum starts this way but the main characters quickly find out that the ship is filled with murderous creatures with a taste for human flesh. Of course, they're not the worst that's on the ship. The 2006 made-for-ITV movie Ghost Boat centres on a ghost submarine, which surfaces in the middle of the Black Sea forty years after being reported lost in action, In Working Order but completely empty. It is put back to sea with a crew of modern-day Royal Navy submariners, with the only survivor (played by David Jason) of the original crew on board as well. They retrace the ship's original course as closely as possible, whilst the sole survivor starts to regain his memories of the last few weeks before the boat was lost and he was found floating in his life jacket with a bad concussion. Then things start getting weird... The crew start seeing ghostly German warships and aircraft, and entries in the ship's logbook start appearing where there'd previously been none. The crew start to act increasingly like the WW2 crew, and eventually David Jason's character has to sabotage the sub when the actions of the possessed captain threaten to start WW 3. The sub sinks with the captain and David Jason aboard... and later is found drifting again, this time looking as battered as a sub abandoned for 40 years should, and with no sign of the bodies of the captain or Jason. The bulk of Triangle plays on the Aeolus, a deserted cruise liner stuck in time, its crew and passengers long gone. The eponymous vessel in Death Ship (1980), which turns out to be a Nazi prison vessel sailed by the murderous ghosts of its crew. In Ragnar's Claw, the Space Wolves are sent to clear a space hulk, a conglomeration of dead ships, asteroids and wreckage fused together over the eons that floats in and out of warp without visible control. In The Emperor's Finest, Ciaphas Cain helped clear a space hulk alongside the Reclaimers Space Marine chapter. It was infested with purestrain Tyranid genestealers, who proceeded to carve their way through the Space Marines' Terminator armor — the biggest, baddest powered armor a living Marine can wear — without any real trouble. "Three Skeleton Key", a short story by George G. Toudouze, is about a derelict ship running aground and discharging a Swarm of Rats, which invade a nearby lighthouse. It was famously adapted as an episode of the '50s radio series Escape, narrated by Vincent Price. In Bram Stoker's Dracula, the Demeter runs aground at Whitby with all the crew missing except the captain, whose corpse is found lashed to the helm. However, a ship's log is found which provides clues as to what happened aboard the vessel. In several of The History of the Galaxy novels, characters find derelict ships that have long been abandoned by the crew. In most cases, these are colony ships from the Great Exodus period of human history, when hundreds of these left Earth using an untested and unreliable method of Faster-Than-Light Travel. In one novel, a military officer from Earth is sent by his superior to find the location of the Alpha, the first extrasolar colony ship that disappeared minutes after engaging its engines. He manages to find the ship drifting through a nebula with not a soul aboard. He then gets attacked by a strange cyborg-like creature. Based on the captain's log, he finds out that the colonists were forced to make planetfall on an inhospitable world nearby, leaving the ship adrift in the nebula to gather hydrogen using its Bussard collectors. The cyborg is from a classified military project of that time. Another novel has the Confederacy of Suns find a derelict planet. Unfortunately, despite being nearly a billion years old, the automated defenses are still functional. When Septimus and his friends climb aboard the Cerys in Syren, at first it looks deserted - it turns out that pirates have imprisoned the entire crew in a safe room below deck. The central mystery of the Alex Benedict novel Polaris revolves around a spaceship that abruptly went out of communication and was later found completely empty. All the shuttles and spacesuits were still aboard, the airlocks were still sealed, and the computer had no record of what happened. Robert Westall short story anthology Break of Dark features a ghost plane. It returns from a bombing raid intact but with no one alive except the pilot, who's unresponsive and continues to go through the motions of flying it, even after he's been hospitalized. In The Oregon Files book Plague Ship, the crew of the Oregon come across an derelict cruise ship. The passengers and crew have been infected with a highly contagious hemorrhagic virus that stops just short of liquefying its victims, which kills everyone save one survivor. The Boojumverse story The Wreck of the Charles Dexter Ward, a sci-fi Cthulhu Mythos story by Elizabeth Bear and Sarah Monette. A Sapient Ship and its crew have been killed off and its crew 're-animated' by a Mad Scientist. Turns out the leader of the 'rescue' team knows all about this — his fellow crewmembers are not so happy, and decide to put a stop to things before they become the next experiments. In one of the Sten novels, Sten's friend and her crew find a ghost ship. She discovers something important- and vanishes, as does her ship, the ghost ship, and everyone on them. Despite hours of searching, nothing is found of them and no explanation is given. In the Malazan Book of the Fallen novel Assail, news of a massive gold find causes thousands of fortune seekers to sail for the mysterious continent of Assail. Many try to reach the gold fields by sailing through the Dread Sea, not realizing that the sea was produced when the glaciers of a magical ice age retreated north and it is still infused with enough magic to drive most people insane. Crew members feel a compulsion to jump overboard, and soon you have a lifeless ship drifting in the middle of a fog covered sea. Later arrivals discover these ghost ships and the ensuing dread and paranoia only drive them insane faster. By the end of the novel the sea has hundreds of ghost ships floating in it. One of the Terran Trade Authority books by Stewart Cowley. Space Wreck: Ghost Ships and Derelicts of Space, is entirely on this subject. In two Doctor Who  Expanded Universe short stories the Mary/Marie Celeste (spelling varies) is seen. In the Doctor Who Annual 1970 story The Mystery of the Marie Celeste the Second Doctor and Jamie McCrimmon find that the people aboard are abducted by Arcturans. The Doctor manages to save them only for the people aboard the ship to be eaten by a sea serpent. In the Daleks Annual 1976 story Timechase two time travellers come to the MC while pursued by Daleks, in a manner not entirely dissimilar to "The Chase," below. I Favor The Villainess has a ship full of undead threaten to ruin the summer holidays of the protagonist, Rei, not to mention murder and destroy her hometown, and the summer villa of her love interest, Claire. Air Crash Investigation: The name of the episode "Ghost Plane". It concerned Helios Airways Flight 522, which lost contact with air-traffic controllers and was intercepted by Greek fighter jets, which found that everyone on the plane except the male flight attendant was unconscious. The plane ran out of fuel and crashed. It was determined that an incorrect setting on the cabin pressurization panel caused the pilots and passengers to succumb to hypoxia. The Liberator is first discovered adrift in space after the crew abandoned ship during a space battle. It is protected by a defense system that lures intruders with hallucinations of absent friends or family. In "Time Squad", the Liberator receives a Distress Call from a tiny spacecraft with a crew in suspended animation. They revive and attack the Liberator crew, having been conditioned to protect its cargo against all intruders. In "Killer", an obsolete deep space exploration vessel turns up at a Federation base. When they retrieve the corpse of the pilot, it revives and attacks the doctor doing the autopsy, breaching quarantine and spreading a deadly plague throughout the base. In "Sarcophagus" the crew encounter an alien vessel containing the corpse of a dead woman. Turns out she's Not Quite Dead, surviving as an Energy Being who takes over Cally and then the Liberator. The second season of Bron|Broen begins with a ship colliding with the titular bridge, which proves to be completely deserted apart from a group of young people chained up in the hold, who have been infected with plague. The Cape , a short lived 90's series about NASA astronauts, had an episode where a satellite repair crew encounters a derelict Soviet spacecraft from a failed moonshot attempt — with her two crew members still aboard. In the First Doctor serial "The Chase", the Mary Celeste is a waypoint. It's revealed the crew was killed by Daleks. "The Wheel in Space": The Doctor and Jamie land on an abandoned spacecraft and are picked up by a team from a nearby space station, the Wheel, tasked to find out what had happened to it. "The Ark in Space": The Doctor, Sarah and Harry, having landed in a ship where roomfuls of people are in suspended animation and there is a giant insect corpse in a cupboard, are forced to figure out what is going on. The space station reappears in "Revenge of the Cybermen". "The Girl in the Fireplace": The Doctor, Rose and Mickey land on a ship with technology that appears to be made out of human parts, and a portal to pre-revolutionary France. "The Curse of the Black Spot": The spaceship on the other side of the portal from the pirate ship, where the Siren comes from. Its alien crew was killed by an Earth virus, and the Siren, as the ship's medical hologram, hasn't had much to do since. Several times in Red Dwarf, such as the ship with the DNA-editing machine. "Derelict ", more widely known as Fifteen Men on a Dead Man's Chest. Where the titular derelict turned out to be a ship with all crew slaughtered by each other, over a hold-ful of Spanish gold and silver. Most of the song is something between a still-life painting and "English for Coroners". "Space Oddity" by David Bowie. It's about, err... an early stage of the orbital derelicthood. SCP Foundation, SCP-1260 ("HMS Tiresias") . The HMS Tiresias is a former British Royal Navy frigate that sails the oceans without a crew. If anyone comes on board, a fog starts appearing around the ship after twenty minutes and completely surrounds the ship after 35 minutes. At 45 minutes the fog dissipates and the ship has disappeared. It travels to an unknown ocean with a pitch black sky and other ghost ships sailing in it. The people aboard die one by one and when they're all dead, the ship returns to our world again. Ravensblight is sufficiently close to the coast that sailor's tales are often heard in the taverns, one being that of the Banshee, a vessel that disappeared after sailing from Boston under the command of Nathan Starch, only to be sighted by whalers off the Australian coast in 1884, and several times since; including one when a Norwegian fishing vessel tried to recover her, retrieving, at the cost of three of their crew, letters, diaries, and the captains log, which only contained the single entry "IT SHALL BE MINE." The ship had been somewhere Man shouldn't go and brought back treasures that were not to be disturbed. The ship disappeared again in the fog, despite being tied on. The Cool Kids Table game The Wreck obviously has this, since the game system is titled "Ghost Ship Enyo". The fifth episode of Jemjammer, "Ghost Ship", naturally has one. It's manned by skeletons. Any tabletop game which allows for both undead and ships is likely to feature one of these at least occasionally. In these cases it's not always a mystery how the ship has gone so long without foundering or running aground... just because there's no living crew doesn't mean there's no crew at all. Dungeons & Dragons mentions the Ship of One Hundred, a pale white caravel that travels the cold, acidic seas of Porphatys, fifth layer of the prison plane of Carceri. It moves about on the layer, picking up passengers, empty save for exactly one hundred stone sarcophagi in its lower deck and hold. No one's sure what's inside them because whenever someone announces an intention to check, the caravel is next seen completely empty of passengers. For this reason, any petitioners or planar travelers using the ship to get around strongly discourage the curious from messing with the vessel's cargo. The old dreadnought battleship USS Texas was energized with magic when the rifts came. She initially served as a shelter for people fleeing the rift storms, and not only carried them through, but actively protected them with a will of her own. She is a benevolent protector whose magically-augmented guns and armor can stand toe-to-toe against cruise missiles and lasers. USS Constitution and HMS Victory often appear out of a sudden fog to save people from pirates, demons, sea monsters, and any of several not-so-nice governments. Both ships are manned by heroic apparitions of their former crews. HIMS Yamato will appear out of nowhere to come to the aid of Japanese ships in need. It's believed that she would probably attack any American or British vessel. USS Arizona sometimes appears in ghostly form when ships (usually American, but not always) are in danger in the Pacific. She appears to be crewed by the ghosts of the sailors and marines who died aboard the battleship on December 7th, 1941, and the ghost of Rear Admiral Isaac Kidd frequently walks around the flag bridge looking for his Annapolis class ring. Though the ship and crew are benevolent, they are marked by the trauma of their death, and any living soul who boards Arizona will have vivid nightmares and eventually go insane if they stay too long. A haunted F-4 Phantom will carry its pilot and RIO through any dogfight, with the voices of men who flew it in the Vietnam War giving advice in emergencies. The catch is that the pilot and RIO will occasionally have vivid nightmares about air combat in Vietnam. A ghostly 1974 Plymouth Fury police cruiser patrols the western USA, often teaming up with lawmen. It will occasionally chase a ghostly red 1965 Ford Mustang that also haunts the highways. The two ghost cars will join forces to protect people from a malevolent 1969 Cadillac hearse that feeds on the blood of its victims. A phantom Soviet November-class submarine with a severe radiation leak will attack any vessel it encounters. U-2666 was a German Type-XXI U-boat launched in April, 1945. The boat was given to the Waffen-SS, commanded by a fanatical Nazi with occult hobbies and his hand-picked crew, and disappeared after Hitler ate his pistol. The U-boat has reappeared since the Rifts came, and is quite possibly the most evil force in the world. It glows a sickly green, it leaks blood when damaged, it smells like rotting flesh, the crew are intelligent zombies, and it's best not to think about what happens to the handful of unlucky bastards who've been dragged inside while still alive. Every navy on Earth, including the Coalition, have standing orders to shoot on sight. Rocket Age has the Sky Queen, a space ship rumoured to be possessed by some strange Jovian gas being, that supposedly patrols the skies of Jupiter, attacking ships. FTL travel in the setting involves traveling through what is basically Space Hell, so ships use barriers called Gellar Fields to try to keep the crew from being eaten (or worse) by daemons during voyages. When those fields fail, the ship may reappear in realspace without a crew, or an entirely different crew. This is why Event Horizon is considered by the fanbase to be a prequel of sorts to 40K, as the film's premise and execution is very close to how this would happen in the game's fluff. If a ghost ship isn't recovered and is lost to the Warp, it may merge with other derelict ships or various detritus and become a Space Hulk, an unnatural conglomeration of several vessels that drifts across the galaxy and in and out of realspace. They're greatly feared since they're often infested with Orks, Genestealers, or worse, but depending on the ages of their component ships, Space Hulks can also contain immensely valuable technological relics. For both reasons, the Inquisition is keen on investigating Space Hulks whenever they appear, a task that usually falls to the Space Marines. The Yu-Gi-Oh! game has a couple, the old card Skull Mariner (which has always been a Joke Character, as it has no practical use) and the far more useful Ghost Ship (useful in Xyz Summoning if you use Light-Attribute monsters). A piece type in the old game Pirates Of The Spanish Main. Usually belonging to the Cursed faction, though with a few amongst the Pirates and British, they had the power to move through islands and not much else. The haunted house S.S. Frightanic from Universal Studios' Halloween Horror Nights 1998 and its Spiritual Sequel Ship of Screams from 2003 both took place on ships haunted with the ghosts of their passengers and crews. Return Of The Obra Dinn is all about how the titular ship became one. In 1802, the ship set sail from England, but never reached its destination. It was declared lost at sea after no contact with the ship had been made for six months. Five years later, the ship mysteriously reappears with no explanation, and the player is tasked with finding out what happened to the ship. It's a complicated Gambit Pileup involving a magic treasure chest, a sea monster, and kidnapping of a wealthy family. The first half of Cold Fear takes place on a Russian whaler called The Eastern Spirit. At first it seems deserted. Then you encounter the panicked survivors who open fire on you. Then you encounter what they're panicking about. In Star Ruler, ships that lose power from generator destruction, run out of fuel, or suffer crew death (or in the case of a computer controlled ship, power loss) will go derelict and drift off into deep space. 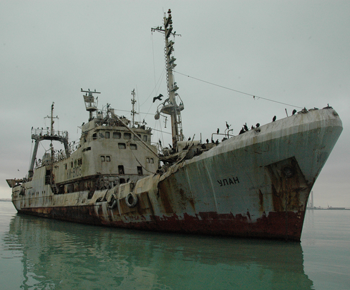 Derelict ships can be reclaimed, so long as the equipment needed to run it is still in working shape. In Granblue Fantasy, one boss shares a name with (and is inspired by) the real-life Mary Celeste. Clearly evident in its base form, Celeste is a ghastly spectral airship which later on reveals a humanoid body and the ability to emit fog in its Omega version. Grandia features a deserted ship with a heavily "undead" atmosphere, although the characters find out that the Big Bad of the ship is just a 'regular' (giant, magic-wielding) squid. This is actually truer to the trope as described here, since they discover what got the crew, rather than undead versions of the crew themselves. Super Metroid has a wrecked ship, complete with flooding, electrical discharges, ghosts, and weird bouncy things. Another one appears in Metroid Prime 3: Corruption, where Samus is sent to the wreckage of a Federation starship lost in battle. In retrospect, it was probably a better idea not to. There's the Frigate Orpheon in Metroid Prime and Biologic Lab's Station in Metroid: Fusion where the Ghost Ship is the backdrop for the whole game. Metroid: Other M takes place on the Bottle Ship, which is essentially this. A Homeworld mission had you investigate a ghost ship. While it ignored strike craft, it would immediately take over any capital ship that got within range. When you had no ships in range of its effect, it looked like a derelict in a mass of other derelicts. As an extra bonus, amongst those other derelicts was a missile destroyer - which was extremely effective at taking out strike craft. However, if you spammed it with enough fighters, (that is to say, shield your salvage corvettes from the missiles using a meaty fighter), you could salvage that missile destroyer, giving you strike-fighter superiority several missions earlier than normal. In Stationfall, the cause of the station's emptiness turns out to be an alien artifact that corrupts and controls technology; if you lose, it duplicates itself and spreads the copies throughout human space. Rogue Galaxy had a ghost ship level, which was also the Bonus Dungeon in that particular game, available only after the main story. It even had a special guest NPC. Suitably for a game mostly set at sea,Suikoden IV has a Ghost Ship level. A notable difference is that the player had to chase it down on the open sea by following clues, rather than happen upon them by chance as part of the story. In Ocarina of Time, Link gets aboard on the fabled "ferry to the other world" in the Shadow Temple, crewed by Stalfos. Made creepier by the fact that it doesn't sail on water, but on air, and it sinks when it meets the goal line. The Wind Waker features a Ghost Ship that sails around certains islands from the Great Sea depending on the phase of the moon: Crescent Moon Island during full moon, Diamond Steppe Island during waning gibbous, Bomb Island during third quarter, Spectacle Island during waning crescent, Five-Star Isles during waxing crescent, Star Belt Archipelago during first quarter, and Greatfish Isle during waxing gibbous (the new moon phase is never seen in-game). Diamond Steppe Island happens to be the place where Link can find the chart that allows him and the King of Red Lions to enter the Ghost Ship and look for the Triforce Chart that lies within. Interestingly, though the ship itself is harmless, some Fishmen are horrified by it, while others talk enthusiastically about it. Phantom Hourglass, the direct sequel to Wind Waker, has a literal ghost ship which is called the Ghost Ship. It sails around abducting people and stealing their life force. The Sandship in Skyward Sword is not haunted, but evokes the feel of a ghost ship because of its derelict appearance and absence of any souls aboard, except for a couple of bats and a miniboss. Once he's defeated, the ship can be reverted to an earlier state via a time displacement field, bringing the crew and the monsters back to life. The U.S.G. Ishimura of Dead Space is essentially one huge Ghost Ship. The Von Braun of System Shock 2. The entrance to the Valley of Bowser in Super Mario World is protected by a ghost ship, that appears deserted at first, but then suddenly the room fills up with ghosts. It's all but stated, at least in the manual, that it may well be one of the flying ships used by Bowser's minions in Super Mario Bros 3. In Super Mario Galaxy, there is one located in the underground area of Deep Dark Galaxy. The Ghost House level in the world Sparkling Waters in New Super Mario Bros. U, as well as the one in World 6 of Super Mario 3D World, are actually ghost ships (though the latter is still represented by a Ghost House diorama in the overworld map). Final Fantasy VIII: Squall and Rinoa end up on a spaceship that was abandoned for 17 years and overrun by regenerating alien monsters. Since it is Final Fantasy VIII, the ship is in full working condition, and they clear it of alien monsters and claim it their own with relative ease. Early on in Final Fantasy V, your party ship is set adrift and end up in a ship graveyard. Naturally, you have to navigate through several derelict ships to reach land, fighting several undead enemies along the way. The Ghost Ship from Tales of Vesperia. The Elizabeth Dane in Vampire: The Masquerade  Bloodlines, whose crew was wiped out while carrying the game's central MacGuffin, leaving only an Apocalyptic Log and a lot of blood. Dot Hack GU. During a quest, three characters are in an empty room where usually there are some NPCS. One character mentions nervously that it's "just like the Mary Celeste." Ni no Kuni. The party has to fight a cursed pirate crew on a ghost galleon during one part of the game. The crew, understandably, are all reanimated skeletons. After the pirate captain is defeated, he and his crew go to the afterlife. Seiken Densetsu 3 at one point in the game has you boarding a ship to get to the next continent. Strangely, no fee is charged (unlike every other boat ride) and when you go to sleep, you wake up to find the ship is actually a ghost ship. By the way, the boss ghost is very difficult to beat (most of the time he's out of reach of your weapons) and before fighting him, one of your party members turns into a ghost too and becomes unable to fight. Cryostasis is made of this. A lone meteorologist finds himself on a derelict Soviet nuclear icebreaker, missing for over a decade. The ship is completely frozen, and the crew are either dead and perfectly preserved by the cold, or dead and somehow mutated into ice monsters. The player character also sees both ghosts and flashbacks of events as everything was going to hell aboard. In Xenogears, the heroes explore a drifting ship whose crew was attacked and killed by the seemingly undead monsters called Wels. At one point, when they turn on the showers and a spray of red fluid pours out, prompting one of them to react with a horrified "what happened on this ship?" - but then it turns out that it's just rusty water. The MSV Worthington from Mass Effect. You find a ship adrift in space, with only basic life support functioning. Fusion cells scattered around the ship are rigged to explode if you get too close, and in one room you find a brain-dead man hooked up to a life support machine. By listening to audio logs, you can piece together the story that the man, Jacob, was exposed to vacuum for too long and died, but his biotic girlfriend Julia slowly went mad from grief, and killed everyone else on board when they tried to take Jacob off life support. Which is when she appears behind you and tries to kill you. Mass Effect 2 has two: The MSV Estevanico, which crashed on Zanethu about a year before the events of the game. Even though it's a fairly recent wreck, it's falling apart and it's also extremely creepy. And we also have the dead Reaper. Abandoned for what's estimated to be 37 million years, and the people who found it quickly went crazy due to being indoctrinated. The level also counts as an almost literal ghost ship, since even though the ship is all but dead, dead gods still dream. The Legend of Dragoon has the Queen Fury crashing into a phantom ship filled with undead enemies, and where some important information about the Black Monster is learned. The "Sunken Ship" level in Ōkami, complete with Chest Monsters, ghosts that keep floating towards you even on the brush screen, the phantom heads of previous bosses that fly straight into the camera in an apparent attempt to eat your face, Spikes of Doom, a completely inexplicable giant hand that tries to squash you, and a couple of crab-demons living on a pile of bones that turn into an enormous armored shark. The ship returns in Ōkamiden with a twist: You travel to the past just before it gets attacked. You have no idea when this will happen, only that it will. Space Griffon VF9. See above example with Space Hulk. Imagine if a Tyranid Tyrant manifested into an ever-evolving monster by not only understanding but controlling and absorbing energy from The Warp, enough to inflict long-distance mind control and mutation upon your fellow soldiers, and change the Genestealers to rogue machines and Body Horror Silent Hill creations. There's a reason why you'll brick the toilet with this game despite the fact it places you in a vaguely familiar transforming mecha. Though, a good half of it IS atmosphere. If you aren't really 'feeling' it, it just won't affect you as much aside from the long-range powers thing. Mario and company have to explore one of these in Super Mario RPG to retrieve the Star Piece that landed in the ocean. Double subverted in Chrono Cross. The party while sailing through dense fog runs across a ship that is known as a ghost ship and decides to rest, but quickly finds that it's in fact a pirate ship using the legend as a deterrent. After being taken prisoner the party finds out that another ship has arrived directly adjacent, an actual ghost ship... with actual ghosts. Knights of the Old Republic II has the Harbinger. According to the ship's Apocalyptic Log, the Sith vessel the assassins came from, was no different. Then, there's the Ravager, which, while not really a ghost ship, it's got the look of one, and it's crew is made up of zombies, with an actual ghost/Humanoid Abomination for a captain. The Starship Titanic, due to a premature launch (basically had its moorings cut while the crew finishing out the interior was on break), is populated solely by the robot support staff and an obnoxious parrot belonging to one of the decorators. Oh, and a flock of starlings in one of the upper chambers. The Herculania in Morpheus, stranded in northern Greenland. Bonus points that the actual ghosts of its passengers are still roaming the ship. The Letarri Colony Ship Laeril became this in Prominence, when its crew evacuated before the nearby sun unleashed a titular phenomenon that short-circuited the ship's computers and sent it drifting towards the sun. With you being the only one left on board, it's up to you to fix the ship and complete the colonists' mission, one way or another. Castlevania: Rondo of Blood and its remake feature a stage set in and around a ghost ship. Worth noting is the painting that comes to life and flies around the room - if it touches you, you're dead! There's also one in Aria of Sorrow, which is mostly scenery. Sonic Rush Adventure has the Haunted Ship stage, culminating in a boss battle against a robotic pirate. Sword of the Stars has the aptly named Alien Derelicts, which are actually broken-off sections of a larger craft. Bear in mind that even so they still are larger than player-buildable dreadnoughts... and their weapons are still active. Subverted in the sequel, in which the Derelicts are revealed to be broken down pieces of Power Armor used by the Suul'ka. The Dragon Quest series has had several ghost ships. Dragon Quest III and Dragon Quest Monsters 2 had ships that still sailed with an undead crew. Dragon Quest VI had a sunken ship you could explore once you gained the ability to travel underwater. Endless Ocean has a large derelict pirate ship which transports the player to and from Ship's Rest, an area with a giant sunken ship that is "haunted" by a very large and pissed off shark. Every ship you come across in Deadnaut is of this variety. Halfway through The Adventures Of Rad Gravity, your spaceship is damaged in an asteroid field, and to find spare parts you must search an abandoned ship. Captain Kunkka in Defense of the Ancients: All-Stars summons a ghost ship that sails across the ground, leaving a trail of rum that protects allies from damage, then crashes and stuns enemies. In the words of his DotA 2 incarnation: "Now that was a failboat". The first action level of Marathon: RED has you investigate a Pfhor ghost ship, which turns out to be infested by The Virus. One appears in Lufia II as an actual boss fight. There's one in Mystery Case Files: 13th Skull, although it only appears briefly during the finale. If you shelled out for the Collector's Edition, most of the bonus gameplay is on that ghost ship. The main setting of Resident Evil: Revelations is the SS Queen Zenobia, a seemingly abandoned cruise ship adrift in the Mediterranean Ocean. Resident Evil Gaiden is set entirely on a ship, the Starlight. Tomb Raider II has several levels taking place in a sunken luxury liner beneath the sea and you explore the insides of it for an important item. Naturally the ship is full of wildlife that will try to kill you, along with cult members who are also seeking the object you're trying to find. In The Secret World, the first dungeon, the Polaris, is one of these. It crashed near the New England area in the first part of the game, and carried some of the creatures that are found in that area. A lighthearted example appears in Bravely Default, as might be guessed from the ship's name, the SS Funky Francisca. The ghosts are completely harmless, serving to fill in minor details in the backstory of other characters, and the only threat is the ship's single living crewmember, Barbarossa. He tries to kill you, but it good-natured about it. Even after you defeat him, his spirit continues to captain the ship. All crew members have died. Your ship will continue to drift for eternity, or until looters destroy it. The Witness: There's a derelict ship stationed in the northeast section of the island, accesible through a back door in the keep which leads a path across the cliffs. The game doesn't explain how it ended up in that state. It's somewhat empty, as it doesn't have any laser-related puzzles, containing only a few optional things such as an audio log, a discarded panel with a triangle puzzle and several environmental puzzles. However, what makes it creepy, apart from the feeling of abandonement, is the strange noises that can be heard in the cabin. They are merely dripping water and the ship creaking, and they're involved in one particular sound puzzle that's also found there, but the fact that no other part of the game features such sounds is quite disturbing. The first Uncharted has this with the U-Boat found in the Amazon rainforest, however Nate doesn't get to figure out what happened to it until much later in the game, only noting that the Captain was "ripped to shreds" and assumed that the boat must have gotten stuck up the river during flood season. the U-Boat was visiting the Amazon looking for the literally cursed El Dorado statue, and the crew was killed by a zombified victim. The middle third of Republic Commando is set on a ghost ship, the RAS Prosecutor. After a couple of levels of wandering though a mostly-deserted ship you discover the reason why it's filled with dead clones and start shooting the problem. Several anomalies in Stellaris involve coming upon ghost ships as you explore the galaxy. Sometimes you can study their designs and earn some research points, while in one case you may learn too late that a ship's crew fell victim to a Hate Plague that spreads to your science ship and ends in its destruction. And with the Leviathans DLC you might stumble upon the Automated Dreadnought, a titan-class vessel that can hold off entire fleets by itself, and has been guarding a single system for millions of years on an automated patrol, with the mummified remains of its crew still at their battlestations. The Ellie Arroway in Angels 2200. In Impure Blood, reports of this are part of the Vagueness Is Coming. Schlock Mercenary has the Post Dated Check Loan, an old superdestroyer that Tagon's Toughs bought cheap. Turns out that the reason it was so cheap was because it was haunted, and the screams of damned souls had driven the AI insane. They don't have to fight any monsters or ghosts, and they manage to get the AI and ship into working order relatively swiftly. Bed Time Stories Youtube Channel has the story of the SS Ourang Medan, a Dutch freighter found with all its crew dead, and mysteriously sinking not too long after being found. The first two episodes of Transformers: Beast Machines more or less applied this plot to the entire planet. In Danny Phantom, all the adults of Amity Park suddenly "disappear", going on a mysterious cruise, leaving all the kids to party and The Hero left pondering the mystery behind it. It's caused by a pirate ghost, complete with a literal Ghost Ship. Long John Scarechrome's ship in Filmation's Ghostbusters. The Lloyd in Space Halloween special. Nothing on the abandoned space station but the four main characters and a demonic hungry alien. The Looney Tunes short "The Phantom Ship", starring the forgotten characters Beans the Cat and Ham & Ex. Double Subverted in The Venture Bros. when the cast is retrieving a crashed experimental aircraft from the ocean floor, only to be boarded and attacked by ghost pirates. They find out pretty quickly (after Brock kills one) that the ghost pirates are just normal pirates pretending to be ghosts, but then the experimental aircraft actually turns out to be a ghost ship, complete with ghost pilot... who isn't really interested in doing anything other than floating around and screaming. In the very second episode of Scooby-Doo, Where Are You!, "A Clue For Scooby-Doo," the gang tracks down the disappearances of yachts to an area called "the Graveyard of Ships." And of course, several times they've encountered ghost pirates and their crews. The Mary Celeste was found adrift near the Strait of Gibraltar in 1872. The Canadian brigantine Dei Gratia found her in a dishevelled but seaworthy condition, under partial sail, with plenty of provisions onboard and with her lifeboat missing. The ship's papers and navigational instruments were also gone, though the captain and crew's personal belongings were undisturbed, and the last entry in the captain's log was dated ten days earlier. The cargo hold had some minor flooding, and it was later discovered that nine barrels of industrial alcohol the ship was transporting were empty. The ten people (eight crew and two passengers) who had been aboard when the ship sailed were never found. Wild theories as to why are still tossed around, such as mutiny or attack by pirates. The Dei Gratia captain, David Morehouse, knew the captain of the Mary Celeste, Ben Briggs, and had dined with him the night before the Celeste left on its voyage. This lead to some speculation that perhaps Morehouse had been involved in the disappearance of the crew, possibly to profit from the salvage claim for finding the ship, though no evidence of this was ever found. A book has suggested that fumes from the barrels of industrial alcohol in the ship's hold started to overcome the crew as they were becalmed. To escape the fumes, everyone got into the dinghy to wait for the wind to pick up and blow away the fumes, and somehow the rope came undone. Especially sad because the two passengers were the captain's wife and child. Another, more plausible theory was given at the time by an experienced sea captain (who had even commanded the Mary Celeste a few years earlier) once he'd checked the weather records and the ship's manifest. The barrels the alcohol was stored in were notorious for losing up to 10% of their contents by evaporation on the run she was on. Normally, the cargo hatches were left open to allow this to be ventilated out, but the weather was bad on most of that run and so the hatches were sealed. When opened during a patch of good weather, enough alcohol vapor could have been present to cause a worrying rumbling sound as it vented off. Knowing how potentially dangerous a fire and explosion with such a cargo was, the ship's occupants might have gotten in the ship's boat and stood off at the end of a line to wait for things to calm down (or blow up). In this instance, they would have taken the ship's papers, charts, and navigational instruments with them in case the ship did blow up, and these were all missing from the ship when it was found. If the weather turned too rough to return to the ship, they would have had no choice but to wait and hope it got better. Apparently, it didn't, and the line parted under the rising stress of the bad weather and rough seas. The lesser-known, but even stranger case of the Carroll A. Deering , a sailing ship found abandoned off North Carolina's Diamond Shoals in 1921. This case received massive media attention and even a government investigation, over reports of the ship being followed by a mysterious freighter before the crew's disappearance, along with a rash of other missing ships around the same time. Wild Mass Guessing over whether the ship was lost to hurricanes, hijacked by pirates, rumrunners or Soviet agents, victim of mutiny, disease or poison continues to this day. Even even stranger is the case of the Baychimo , a cargo ship which was abandoned after being trapped in Arctic pack ice in 1931. The ship became dislodged from the ice and spent the following 38 years drifting around Alaskan waters, sometimes sighted and occasionally boarded by Inuit and salvagers. She was last seen in 1969. The Lyubov Orlova , a Yugoslavian cruise ship which became the subject of a brief media frenzy when tabloids falsely claimed that it was infested with man-eating rats and was about to run aground on the British coast. In 2007 , the catamaran Kaz II was found deserted with the engines running and all the life jackets still on board. Like the Mary Celeste, the three crew members were never found. What was found was a video camera containing footage of said crew members conspicuously not wearing said life jackets whilst up on deck, making their probable fate fairly easy to guess. The merchant vessel Joyita was found adrift in the South Pacific in 1955, partially submerged and listing heavily to one side, from flooding later determined to come from a fractured cooling pipe. She was 600 miles off course, and her 16 crew and 9 passengers where nowhere in sight. The life boats and dinghy were missing, as was as 4 tons of the ship's cargo. Inside, an open doctor's bag was found, containing used instruments and bloody bandages. The ship's radio was tuned to international distress channel, but further inspection later determined the radio had faulty wiring, restricting its broadcast range to just 2 miles. The ships' logbook, sextant, mechanical chronometer and other navigational equipment, as well as all the firearms kept in the boat, were missing. Bizarrely, the ship's starboard engine had been covered with mattresses, as if to plug a leak — even though her hull was completely sound. No trace of the passengers or crew was ever found, and the case remains unsolved to this day. The Joyita is sometimes referred to as "the Mary Celeste of the South Pacific". A later investigation found the vessel was in a poor state of repair, but determined that the fate of the passengers and crew was "inexplicable on the evidence submitted at the inquiry." The Joyita had 640 cubic feet (18 m3) of cork lining her holds, making her virtually unsinkable, thus investigators were completely baffled as to why the crew would voluntarily abandon the ship. Since 2015, a flotilla of wooden boats has washed ashore in Japan with their decaying crews still aboard. The Korean writing on one the boats (which read "Korean People's Army") and the clothing of the deceased suggests that they were civilian defectors who were fleeing North Korea's oppressive regime. However, that doesn't explain why the occupants of one ship appeared to have been decapitated — or why another contained six human skulls . In 2006, an abandoned tanker was found drifting off the coast of Queensland. Its engines were inoperable, and it sported a broken tow line (suggesting that she had broken loose during transport). Even though there were no signs of foul play or illegal activity, the ship had eerily been stripped of all its identifying markings, and wasn't registered to any port. She was eventually named the Jian Seng . She was never claimed, and it's still unknown where she originated from or why she was adrift (though a large quantity of rice found below deck suggested that she was being used as a supply ship for fishing vessels). In another instance, according to an urban myth, a few teenagers rented a pleasure yacht, sailed out into the open sea, and all jumped into water for a swim - but forgot to loosen a ladder to climb back on board. As a result, they all ended up drowning as they couldn't mount the boat's slick walls from the water. Naturally, the boat was found before the teenagers. This plot was used for the indie movie Adrift. Easily one of the creepiest of all time is the 1947 Dutch merchant ship Ourang Medan, which was discovered by two American vessels in the Pacific after receiving a radio message from the ship that ended in an ominous "I die". In the ship, the crew found the crew's corpses in a frozen state of terror (including their dog) and pointing at something with no visible injuries on their bodies. The ship was also in fine condition and for some reason, an unnatural chill emanated from the still-burning boiler room. The crews prepared to tow the Orang Medan to shore, but the ship mysteriously exploded and sank shortly afterwards. Theories range from leakage from an illegal cargo of toxic chemicals, to inevitable UFO claims, to supernatural attacks by ghost pirates. However many believe the story was simply a hoax, as no records of any ship with that name exist beyond repetitions of the spine-chilling tale. What makes the tale even more dubious is that there is no reference to the ship in Lloyd's Shipping Register (a register of every merchant ship above 100 gross tonnes, first published in 1764, made to help merchants check and see what sort of shape a ship they are thinking of hiring is in), and there are no records of it being registered in any nation, including the Netherlands. One recent researcher concluded the story was a hoax after discovering a nearly-identical story (albeit in a different part of the Pacific Ocean) published in English newspapers a few years earlier, and that the same man (an Italian writer named Silvio Scherli) claimed to be a witness to both events. In 2013, a boat washed up on shore in Long Beach, Washington. The only living thing on board was a tropical fish that was not native to the area. The authorities were rather confused until they cleaned the hull and found a Japanese name and registration number, at which point they realized that the boat had been pushed out to sea during the 2011 Japanese tsunami and had picked up the fish sometime during its aimless journey. The Russian vessel, УЛАНnote pronounced "oo-lahn" (pictured) roughly translated to mean "lancer", was said to have been spotted wandering off the coast of Walvis Bay, Namibia in southwestern Africa.